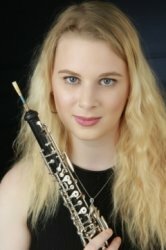 Hi, I'm a 21 year old currently studying the oboe at the Royal College of Music. Music is something I'm very passionate about, and I have achieved grade 8 on the recorder, oboe, piano and voice as well as passing my ABRSMDiploma on oboe in the Summer of 2014. I received my ABRSMDiploma in oboe teaching in the Spring of 2018. I have taught recorder and music theory in the past and currently have piano and oboe pupils. I am the deputy teacher of oboe and recorder at the Latymer Saturday Music Centre. Everyone learns at different paces and some styles of teaching work better than others depending on the pupil. In general, I try to teach them the various ways around an instrument such as technique and sound production at the same time as moving them through grades and improving their playing each week. RebeccaFrom Alison (5/5): Great tutor. No problems. Real musician. Finds tutee's level and works from there. RebeccaFrom Enamul (5/5): Rebecca is an excellent tutor . She is very mature for her age and teaches in quiet but firm manner. My children love her and we are very happy with her.